I had a great shopping time at the Christmas Goose. On the 30th of the month they have 30% off all fabric. AND October was my birthday month soooo I got 20% off everything else. It was awesome. Here are a few pics of my goodies as they wouldn't allow pictures...OK I lied...I did take one pic...but they don't know. O-K I don't have those pictures darn it....so here are some of the fabrics I bought! 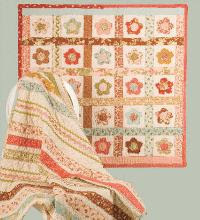 And a pack of Leanne's fantastic patterns for her BOM quilt. I am still organizing my sewing area. These are my some of my yarn piles that I still need to sort. I found several more yards of flannels I didn't remember I had...isn't that horrible? I still love it though and sooo glad I found it. Baby girl E has been suffering for 2 months with ear infections. Her last bought was this weekend and we are on antibiotic #5. The sweet little girl is miserable and making mommy miserable too. I decided that in between taking care of her, I would sew this weekend. I am not cleaning....just sewing and organizing. I 'hoped' to finish the project I started last night. It is mega EASY. I quilted it myself. Here she is sitting on it. I am half way through the binding. The pattern is Cottonway called 'Bundle up Baby Girl'. 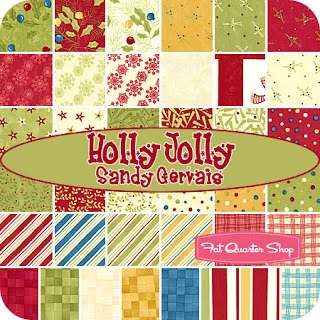 I used Moda Allspice jellyroll and the jumbo rick rack I bought at the Christmas Goose. Did I say this was easy? It totally is, I recommend buying the pattern! So sorry to hear about Baby girl E's ear infection. She's so adorable in this picture. Hang in there! Wow, some REALLY great stuff there! 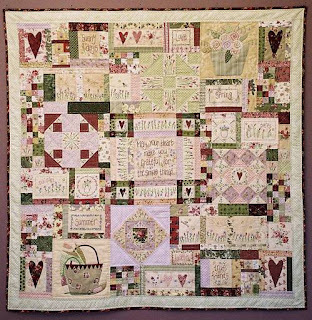 I love that quilt at Christmas Goose with the crocheted edges! Every time I am in there I swear I am going to learn to do that. 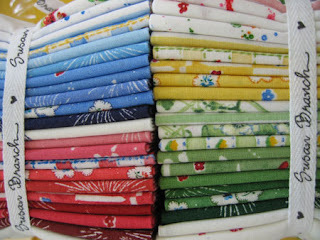 I also love that pattern by cotton way, but I MAY be a little biased seeing as its my mother's. :-) Cute little girl sitting on it too!